Thetford is a prosperous and expanding commercial centre situated adjacent to the A11 trunk road midway between Norwich and Cambridge. Thetford is within the Cambridge-Norwich Tech Corridor, a public/ private partnership that is backing technology based economic activity across Norfolk, Suffolk and Cambridgeshire. 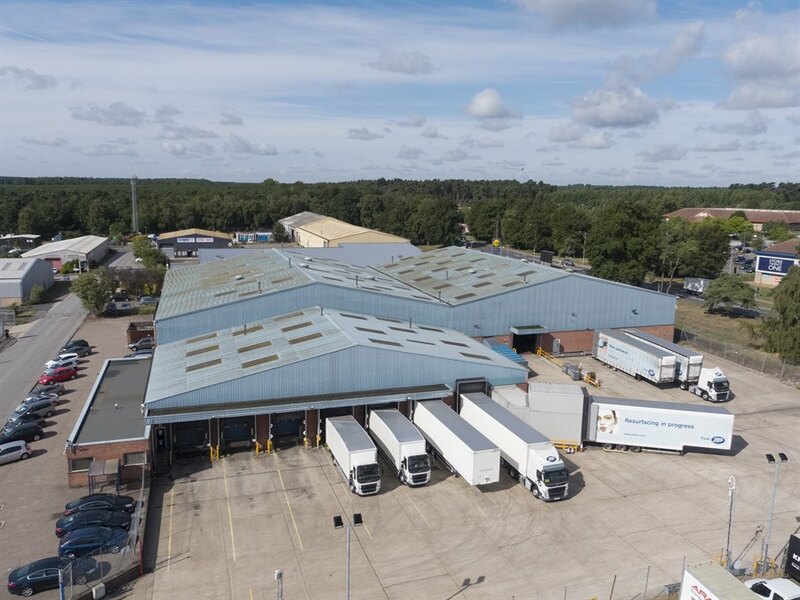 The recently upgraded A11 dual carriageway and its connection with the A14 and the National Motorway Network makes Thetford an attractive distribution location. The substantial populations of both Cambridge, and Norwich and many surrounding towns are within a 40 minutes’ drive. Thetford railway station provides regular services to both Norwich and Cambridge and connections through to London King’s Cross. The property comprises a modern detached distribution warehouse with two storey ancillary offices. The site extends to approximately 0.9 hectares (2.24 acres) providing a low site density of only 47%. The main warehouse is of steel portal frame construction with profiled plastic metal sheet cladding above external brickwork. The eaves height is approximately 6.7m (22 ft) and the property benefits from warm air blowers, 8 loading bays, including 4 with dock levellers. There is a large fully enclosed concrete yard providing secure lorry access and trailer parking. The despatch warehouse has an eaves height of approximately 4.9m (16 ft). The ancillary offices are carpeted throughout and offer suspended tile ceilings with florescent lighting and perimeter trunking. There is a dedicated car parking area for 34 cars adjacent to the warehouse. We have been instructed to seek offers in excess of £2,075,000, (Two Million and Seventy Five Thousand Pounds) subject to contract and exclusive of VAT reflecting an attractive Net Initial Yield of 7.25% and a low capital value of £45 psf.